The Rada Cutlery S46 Heavy Duty Paring Knife and Vegetable Peeler is a great gift idea for all home cooks. This “one-two combo” will allow you to peel, slice and dice your way to a delicious meal. This paring knife and vegetable peeler combo comes with surgical grade, high carbon stainless steel blades. They are designed to be tough, durable and sharp making your life in the kitchen just a bit easier. Trying to think of an affordable gift that someone will love and actually use? Look no further. This kitchen utensil set is a wonderful idea for weddings gifts, birthdays, Mother’s Day, anniversaries and much more! Having less dirty dishes to hand wash is always a nice bonus! The handles on the knife and peeler are made from permanently cast silver brushed aluminum with a satin finish. These utensils should not be washed in the dishwasher. Handwashing is recommended. Rada Mfg. Co. is located in Waverly, Iowa and has been manufacturing cutlery in the USA since 1948. Our mission is all about “providing our customers the best value of kitchen knives for their dollar.” We stand by our craftsmanship. Rada Mfg. Co. will replace any product manufactured by our company returned to us due to defects in material or workmanship. 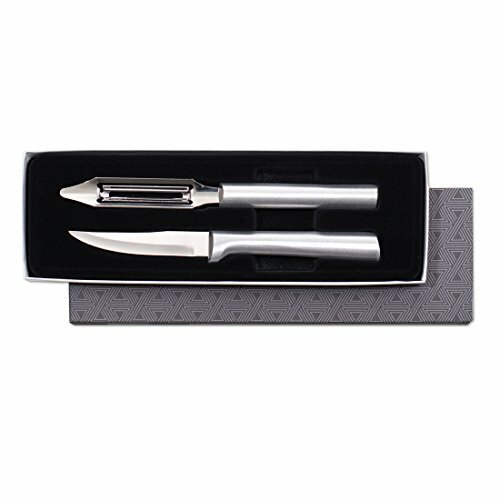 Suitable for any occasion or for yourself, this Rada Paring Knife and Vegetable Peeler set is a smart choice. PEEL, SLICE AND DICE - This paring knife and vegetable peeler combo comes with surgical grade, high carbon stainless steel blades. They are designed to be tough, durable and sharp making your life in the kitchen just a bit easier. GREAT GIFT FOR MANY OCCASIONS - Trying to think of an affordable gift that someone will love and actually use? Look no further. This kitchen utensil set is a wonderful idea for weddings gifts, birthdays, Mother's Day, anniversaries and much more! BRUSHED ALUMINUM HANDLES - The handles on the knife and peeler are made from permanently cast silver brushed aluminum with a satin finish. These utensils should not be washed in the dishwasher. Handwashing is recommended. AMERICAN MADE UTENSILS - Rada Mfg. Co. is located in Waverly, Iowa and has been manufacturing cutlery in the USA since 1948. Our mission is all about "providing our customers the best value of kitchen knives for their dollar."